Storms a-coming! Dig out those old kerosene lamps and batten down the hatches. Kerosene lamps have illuminated many households through the years and continue to do so even in this electrical age. 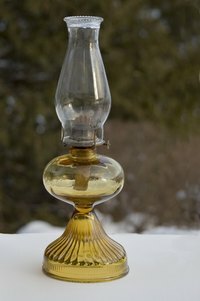 Saving you from dark, cold nights when the power goes out, kerosene lamps use a liquid fuel and a wick to produce a yellow light. The wick can be adjusted to make the light brighter, and the lamp usually has a glass chimney to protect the flame. This produces a steadier flame that is safer than a candle that burns with an open wick, making kerosene lamps useful for emergency situations. Take the kerosene lamp apart. Remove the chimney and unscrew the collar of the wick burner from the fuel bowl. Lower the wick with the adjuster wheel until the wick comes out of the burner. Inspect the parts. The wick may need to be replaced if it is very old because it will not burn properly. If the wick is hard and brittle, replace it with a new one. The burner should be checked for oil buildup and proper movement of the wick wheels. Replacement parts can be bought online or at hardware stores. Clean the entire lamp. Use hot water and grease-cutting dish soap to wipe the fuel bowl clean. Immerse the burner in boiling water with a small amount of soap. Gunky buildup can be cleaned with a toothpick. Polish brass parts with a soft cloth and vegetable oil. Keep brass parts lubricated to prevent rusting and give your kerosene lamp a longer life. Wipe residue off completely. Insert the new wick into the burner by turning the wick adjuster wheel until the wick catches on the interior wheels. The wick should slide into the top of the burner. Trim any frayed edges. Add kerosene to the fuel bowl. Leave about 1 inch of air between the kerosene and the collar of the burner to aid the wicking process when the lamp is lit. Kerosene or lamp oil can be bought at any supermarket or department store. Insert the end of the wick into the fuel bowl, making sure there is enough wick to touch the bottom of the bowl. Screw the collar tightly to the base of the lamp. Wait at least 15 to 20 minutes for the wick to absorb the kerosene. Light the wick, and adjust the wheel to your desired flame height. Place the chimney onto the burner. Always check the kerosene level; the lamp should not be allowed to become empty.